Egypt's opposition movement, the Muslim Brotherhood, has launched its own Facebook-style social networking site. A senior member of the banned Islamist group says the aim is to spread awareness of moderate Islamic values. 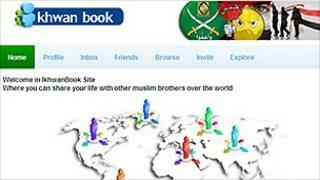 The Brotherhood's version - Ikhwanbook - looks similar to Facebook, but users say it respects Islamic values better. It has more reserved use of photographs, less intrusion in the personal lives of members, and a different attitude to homosexuality. The launch of the website is part of a wider attempt to increase the Islamic group's presence on the internet. The Muslim Brotherhood says they are using the internet, partly because it is one of the few channels of communication left open to them in Egypt. The group is banned, so they have no TV channel, and no permission to publish a newspaper. The Brotherhood insists it does not want to isolate itself from the world, nor to compete with Facebook. However, some Muslims have criticised Facebook for not shutting down anti-Islamic sites, not to mention their unease about the more liberal attitudes and opinions that can be exchanged on Facebook. Because the group is banned, some members have concerns that the government will identify them through their membership of Ikhwanbook. So far the site has only been operating on a trial basis for a few months, but the organisers say there will be a full launch at a later date, when they expect the number of members to increase.